Electronic jingle music. Positive and energetic mood. Contemplative royalty free jingle in a fusion Jazz / electro style. This track features an electric bass, electronic groove consisting of metallic sound effects and an acoustic piano. Short and soft song using clarinet, tuba, acoustic drums and brass section consisting of, trombone, two saxophones and trumpet. Jingle music featuring guitar with distortion effect and electronic arrangement. Royalty free jingle music featuring Indian rhythms and percussions: Dholak, Khol, Tabla, Kanjira and Ghatam. Soft and romantic jingle featuring double bass, accordion, acoustic drums and acoustic guitar. Intimate short track with acoustic bass played with muted palm technic, acoustic jazz drums, prepared electric piano and edited sound effects. Royalty free jingle featuring south American and African percussion such as: bongos, congas, shakers, cowbell and bass drums. Acoustic jingle music featuring acoustic piano, accordion, violin and double bass. Positive and romantic song. Electronic short music featuring drums, bass, pads and spacey synthesizer's sounds. Royalty free jingle music in the jazz style, featuring tenor saxophone, double bass, brass band (trumpet, trombone and tuba) and acoustic drums. A second version of JingleA. Piano, double bass, drums and brass. Third version of JingleA. A royalty free jingle in the Jazz music style, featuring acoustic piano, clarinet, double bass, brass and drums. Royalty free jingle in a jazz style. Instrumentation: Piano, double bass, drums and clarinet. Another version of the JingleB track. Jingle in the Milles Davis Jazz style. Rhythmic piano, double bass and drums. Royalty free jingle featuring brass band, romantic piano, jazzy drums and bass. Romantic and nostalgic music track. Another version of the JingleC music. Here the brass band is more present and the overall energy is more powerful. Piano, brass and drums. Romantic and nostalgic music featuring accordion, violin, viola, congas, shakers and double bass. A second version of JingleD track. Nostalgic and romantic jingle with accordion, piano, double bass, congas and shakers. Royalty free jingle in an acoustic orchestration. Acoustic drums, viola and violin played pizzicato and double bass. Sweet and positive music track. Second version of the JingleE track. featuring accordion, clarinet, Violin, viola, drums and double bass. Third version of the JingleE music. Here with the clarinet playing the main melody. Violin and viola in pizzicato, drums and double bass. Royalty free jingle in the electronic music style. Sound creation and analog synthesizers. Acid bass and keys..
Brief music track. This jingle is in the electronic music style. Drums, synth pads and synth leads. Royalty free electronica music. Acoustic guitar, percussion, drum box, synthesizers and sound design. 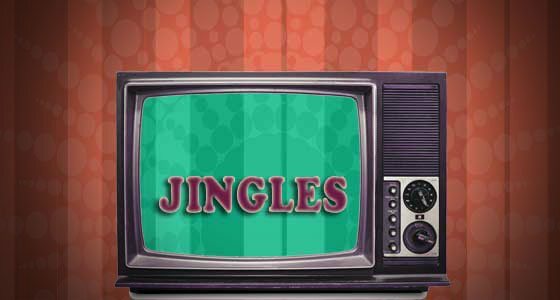 Another version of the jingle JingleH. Royalty free electro music. Drum box, synthesizers and sound design. Royalty free electronica jingle. Somber and mysterious atmosphere. Drum box, electric pianos, synthesizers..
Electronica jingle featuring electric pianos, acid bass and several synthetic sounds. Positive mood. Middle eastern music track featuring qanun, oud, riq, def and electric bass. Festive and nostalgic mood. Royalty free Arabic jingle. Middle east music style featuring piano, riq, def, acoustic guitars and acoustic bass. Royalty free flamenco music. Gypsy track with flamenco guitars, percussion and electric bass. Positive and festive atmosphere. Funk Jazz track featuring piano, trumpet, tenor and alto sax, tuba.. Positive and festive music. Royalty free jingle with fanfare (brass band) featuring Brazilian percussion, trumpets, tuba, trombones, tenor saxophone and baritone saxophone. Royalty free jingle in the Balkan music style. Nostalgic and positive music track featuring darbouka, trombone, tuba, trumpets, clarinet and saxophone. Another version of JingleQ, here with drums, bass drum and snare drum (played rim shot) as well as brass band: trumpets, trombone and tuba. Woodwinds, clarinet and tenor saxophone. Royalty free jingle. Short music track in the electro style. Suitable as youtube video intro, or as radio jingle. Synthesizers are used in the orchestration as well as drum box. A second version of JingleR, track in the electronica music style. Positive atmosphere featuring drum box, synth bass and synthesizers. Royalty free jingle music featuring brush jazz drums, clarinet, tuba, accordion and double bass. Royalty free jingle featuring trumpet, trombone, piano, electric guitar and drums. TAGS: Joy, lightness, brass, happiness, travel, world music ..
Jingle featuring electric sounds and brass instruments. Positive, electro, groove, acid, festive..
Jingle featuring, trumpet, trombone, tuba, violin, drums and mandolin. A 25 seconds version of the music "Eau" in the "Piano" category ... Tags: Jingle, piano, child, innocence, purity ..
Royalty-free jingle. Great for TV News. Short version of the title under the same name in the "Acoustic" category.. Latin feel, party, band, travel ..
Royalty free Jingle. Great for "Nature" or "Weather" shows. Africa, softness, serenity; nature, travel, weather ..
Musical comma. Acoustic guitar, bass and drums. Sound comma suitable for nature, travel or weather programs. Royalty free jingle featuring acoustic guitars bass and drums. Suitable for nature programs. Jingle with bass, drums and piano Rhodes. Suitable for sports programs. Jingle. Works great for sports program. Royalty free jingle. Ideal for traffic information program. Jingle, ,serious, information,. Use the mp3 player to listen to the royalty-free jingle music. You may listen to the full version. In order to download the selected title, click on the green 'DOWNLOAD' button and save the file to your computer or tablet. The downloaded file is a full version of the music in high resolution mp3 format. You may therefore try the music in the contest of your project (intro advertising, radio, television...) before purchasing your license. In order to purchase your license, click on the 'Buy License' button and you will be asked to provide the necessary information to establish a license agreement. You will then be redirected and asked to choose your method of payment. As soon as your payment has been confirmed, you will receive the copyright notice, the license agreement and the links to the uncompressed WAV version of the selected music.